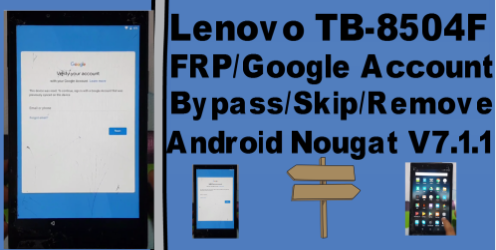 Remove Lenovo TB-8504F FRP Lock Required File. 2# Download V7.1.1 FRP Remove Apk. Remove Lenovo TB-8504F FRP Lock Method. 4# Now disable talkback same time click volume up and down. 7# Play video and click share tab. 8# Now open google crome browser. 10# Download Quickshortcut maker and 2018 frp remove apk. 11# Open Quick shortcut maker apk. 12# Now disable find my phone,google play servic and google. 13# Install 2018 frp remove apk. 15# Rebot your phone and add new gmail.